Less than a week after I posted about one of my musical heroes, Holger Czukay, he died. It was so disturbing to me having just spent a few days playing his records, talking about him and even suggesting that we should get in contact with him and go and visit him as he lived in Cologne, close to where Olivia is from. Even though he was 79 years old and in English cricket’s terminology we can say he had a “good innings”, losing someone that you admire is difficult when you’ve followed them for years. You have a relationship and even though it’s not the same as family, it’s hard to accept when they are suddenly gone. Here in the western world we don’t deal with death well. Having spent some time in Mexico, including celebrating the Day Of The Dead in Oaxaca in Mexico and having been in Bali and ‘invited’ to a local man’s funeral (not by him), I experienced joy in death as relatives helped a loved one on their journey, perhaps that’s how the Irish see it too in their famous wakes. In my world, I see dark images, black clothes, black veils, distraught faces, sobbing into handkerchiefs, a slow black hearse creeping slowly along the road, a string of vehicles following with the relatives and distracted children that have to be stopped from tomfoolery in the graveyard, unaware, playing hide and seek behind the gravestones and scaring each other with stories of ghosts floating about the belfry, wondering why the parents are particularly strict the day that the unknown aunty died. But death in song in our western society has an extraordinary resonance when an artist expresses it from personal experience. When the news came in that Nick Cave’s 15 year old son Arthur had been killed in a tragic accident falling from a cliff near his home in Brighton, one could not imagine the pain suffered by Cave and his family. Nothing can be worse than the tragedy of losing your child. Not to die before your children is the most unnatural of human experiences. Although the album was mostly finished before Arthur died, its haunting atmosphere penetrates as you consider the unfolding tragedy. Jesus Alone is the opening track on Skeleton Tree, released in September last year. It’s beauty from sadness, a catharsis, poetry and emotion and when I see this, I think how deeply we are struck by death in our society, how seriously we take it, how we are unable to respond in any other way except with sadness as we search for meaning in loss. Different cultures see death in different ways, religion seems to help most people wherever you are, but for those of us who are not religious, we can only hope our souls can cope on their own. 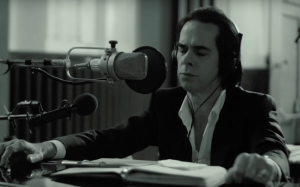 A close death can be expressed as an opportunity to celebrate someone’s rich life but in the case of Nick Cave’s loss, despite all those years of love for their son, there was far too little of his life to contemplate as the future was so cruelly taken away in that split second of a terrible accident.